Come Play on Island Time. Couples Retreat. "Rated Best on Sunset Beach"
We do have openings starting in May 2019 - December 2019. We have April 18- April 30, 2020 available at this time. Minimum 13 day rental. This is really an Island Paradise. Come play on Island Time. Steps to the white powder wide sandy beach.. We have our own private entrance. to the quiet uncrowded beach. Our beautiful beach has been renourished (sand added to enlarge the beach) & the beach is now super wide. Solar heated pool with tiki huts. Dock & picnic area on Boca Ciega Bay side. This condo located in an area of upscale homes & away from the crowded area of downtown Treasure Island. Designed for couples! Maximum number of people is two. If you want to stay on Sunset Beach, look for the condos on the Sunset Beach area map. For some reason VRBO is mixing the 'St. Pete Beach area in with Treasure Island condos. Newly remodeled. The condo is very reasonably priced considering all our many amenities. Also latest rating gives us a "Perfect". Rediscover the two of you. It is perfect for two people. Also we are directly on the Bay on the other end of the property. There is a tall cafe table by the front window of this second floor unit with fabulous views down the Bay. We allow 5 or 6 day stays, one week or more or monthly. For monthly rentals from May to December you can contact me for a reduced monthly rental rate. The condo has 1 bedroom with a king sized bed with a firm mattress. Also a full kitchen with everything you'll need for cooking. There is a 50 inch smart cable TV. One comfortable chair, a couch & café table with chairs in the living room. The bathroom has a tub / shower. combination. There is also an outside shower by the pool. We have free password protected Wi Fi Connect with family & share photos of your day. Truly a Water Lovers dream. Gulf, Pool & the Bay all right there. We are on a narrow strip of land between the two. On the bay side there is picnic area with picnic tables, gas barbecue grills and a dock for fishing, a place to clean your fish or relax & enjoy watching the dolphins, pelicans and manatees. You can also enjoy kayaking & paddle boarding on the Bay. At nighttime watch for the beautiful full moon, or on darker nights check out the endless stars. The condo property has its own private access to the quiet beach. The large sparkling solar heated pool has three tropical Tiki huts to provide shade, an outdoor shower & lounge chairs. A Lush Tropical Garden surrounds the Pool with palm trees flowers & a unusual date palm tree. Lots of chairs for sunbathing or just relaxing. Also for cooking we have a crock pot, mixer & lots of pans & cookware, coffee maker, toaster, blender and teapot. Or, just enjoy one of our many restaurants. The bed & bath linens are provided. There are even beach towels & beach chairs to take to the beach. Imagine the fun of watching for dolphins or pelicans while you enjoy your morning coffee at our cafe table or down at the dock. Take endless pictures of our perfect sunsets. Come back each year & compare your sunset pictures. Stroll the quiet soft sugar sandy beach. Read the rave reviews of our past guests. NO SMOKING. in condo or on on balcony. Clean air, smoke free unit. allowed per condo association policy. Parking is never a problem. There is a reserved parking space for this unit & even a guest space for a visitor. Your guests must sign their car in. Note;: if stairs are a problem, this is on the second floor. I try to show everything as accurately as possible in the pictures. If you like what you see. you should enjoy the condo. We have instant confirmation if the time period is open. Just provide your credit card information. Weekly rate is $595.00 for 2019 plus $75.00 cleaning . THERE IS ALSO 13% LODGING TAX which covers Pinellas & Florida State Taxes which you will be charged for your visit. Daily rate is $85.00 for minimum 5 or 6 day stays. Vacation Rentals is now charging an additional service fee, which will be billed by them. TO PAY or your reservation click on the Book it Now button. I will send you information on check in and other information when I receive a deposit. I am always happy to answer any specific questions you nay have. I describe many area attractions on my condo page. I require a deposit when you confirm your rental. A second Payment is due one month before your stay. If your stay is less than one month away, the entire amount is due. Our condo is very popular & for winter 2020 we are rented for January, February & March & from April 2-17 already..
Also taking reservations for May- December 2019. Check our calendar for available times. Book now when most times are still available. Our schedule fills up very quickly..
CLICK ON THE CALENDAR FOR AVAILABILITY. If our calendar is full, ask about the other condo I have available in the same complex. Check in & check out times can be flexible. You can rent bikes or paddle boards nearby. Just a few steps cross a quiet street from the Gulf of Mexico & its white sand beaches with our own private entrance. Also there is a dock, picnic tables & grills on the Bay. The sparkling pool is solar heated.& surrounded by 3 tiki huts & lots of seating. By walking a few extra steps save you save a lot of money. Tub / shower combination.. Also, outdoor shower by pool. Across a quiet 2 lane street from Gulf of Mexico. we have our own private entrance to our quiet beach. Great views down the Bay. We are in the North building. We are right on the Bay. We have picnic tables & grills down by our dock & picnic area. Great area for paddle boarding or kayaking. Central Air conditioning & also ceiling fans in each room. Assigned space. Also guest spaces if you have guests. They must sign in at the laundry room. This is to keep track of who is on the property. There are bath towels, hand towels, wash cloths & beach towels to take to beach. Small couch, 1 recliner & café table with 2 chairs. Almost everything you could need for cooking. & eating in. Pans, dishes, silverware. Electric mixer, crock pot,, blender. Or you can use the gas grill to cook on by the picnic area. $2 charge. Full kitchen with stove, refrigerator & microwave. Cafe Table with seating for 2. and beautiful view down Bay. Cable TV. 50" Smart TV in living room. 30" TV in bedroom. Beautiful tropical garden around pool area. There is a balcony. You may sit out there. When not sitting out there, please take chairs inside. You can rent bikes, canoes, paddle boards locally. There is a fishing dock with seating & place to clean your fish with running water. The patio area in back has picnic tables. for resting or out door dining. Be sure to clean up after your group. Can rent paddle boards etc. Courts in Treasure Island at Treasure Bay Golf & Tennis. Golf course at Treasure Bay Golf & Tennis. Lots of other nearby courses. This is on the second floor if stairs are a problem. We have a large solar heated pool with tiki huts, chairs & lounge chairs surrounded by a beautiful tropical garden. .
Free secure Wi-Fi. Private beach access. Cable flat screen TV in living room & bedroom, Blow dryer. All linens, towels. Full kitchen with: Ceramic cook top stove. Includes cookware, utensils, microwave, coffee maker, teapot, toaster, mixer, crock pot, blender, and iron. Beach chairs, towels, umbrella & cooler to take to the beach. Air conditioning/Heat. Ceiling fans. Pool with tikki huts. Outdoor shower by pool. Fishing dock on intercoastal /great for watching for dolphins & manatee, pelican & egrets. Area on dock for cleaning your fish. Picnic area on intercoastal with barbecue grills and picnic tables. Laundry room in building (you'll need quarters). Trolley that runs along beach for transportation. There are also, free ride companies that will pick you up & drop you off locally. #Tipping expected#. Assigned parking (second space from stairs). No RV or large truck parking. The Sunset Cove #22 was a great spot for me and my girlfriend to spend Christmas together. It has everything we needed for a week long stay. We even cooked Christmas dinner in the kitchen, which had everything we needed to do so. It was easy to get rides from the free services in the area up and down the beach to different bars/restaurants. We were able to rent kayaks and launch them directly from the property which was a great bonus. A few bars are a 5 minutes walk from the location and others spots a bit further, maybe 15 minutes. Overall no complaints. Hearing such nice things from people like you make all we do to make it an enjoyable place to enjoy a vacation, worthwhile. You've pointed out a lot of nice places for other guests to visit. I rented this unit for a few weeks while I was waiting to close on my new home that is close by. The owners of this unit had thought of everything that someone visiting the beach might need — from chairs, a cooler, all sorts of cooking gadgets, to beach towels and pool noodles! Anything else you might need can be found just a short drive away, including Florida’s favorite grocery store, Publix, about 1.5 miles away. 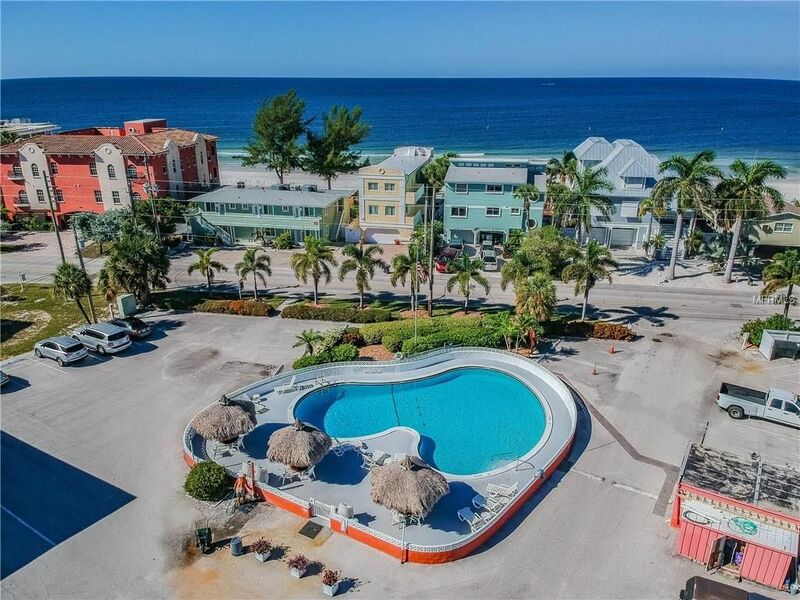 The condo is located in the heart of Sunset Beach - renowned for its beautiful sunsets, and just a short walk away from a couple of restaurants. The complex has a pool, is super clean, has nice laundry facilities, and my fellow guests were respectful and quiet. I didn’t see any “party animals” who were disruptive or noisy, just nice people enjoying their relaxing vacations at the beach. I emailed the owners a couple of times, and they were prompt and friendly communicators. New tv’s and good WiFi are in the unit. This is a great spot for anyone wanting a safe, low-key beach getaway!!! review. We want our renters to be happy & enjoy their stay. We do work hard at trying to give our guests the best possible stay. Your are such a n interesting & enjoyable tennant. Best of luck in your new home. Glad to hear you gave us a 5 star rating. We want everyone to be happy & enjoy their stay. Especially enjoyed your politely worded questions & correspondence. Great little place to get away! We had a great time and lived this location. Thank you. Glad you enjoyed everything. We have the Bay on one end of the property ^ the Gulf steps away. Caddy's Restaurant & Katiki Bar just steps away. There are vans like Jimmies Free Rides who will take you to near by places free-tipping expected. Treasure Island has numerous restaurants, bars & activities. Most restaurants have early bird special with a cheaper menu. Bucs professional football in season. Also Ruth Eckerd Hall and five smaller community theaters & Chihuly Glass Art Museum. John's Pass Boardwalk is at the other end of town. Lounge or sun bathe by our solar heated pool. If you like to 'shop till you drop', you'll love all the great stores & malls within a few minutes drive. Also, lots of fun candy stores, souvenir shops, shell shops, in Treasure Island. Visit historic John's Pass and it's quaint shops. Close by are dolphin cruises, gambling cruises, pirate cruises & charter fishing. Did we mention parasailing, jet skiing & scuba diving & the dog races. Catch the Tampa Bay Rays at Tropicanna Stadium. Disney World & Universal Studios are about 90 minutes away. Busch Gardens & Raymond James Stadium are nearby. Enjoy year round golf at a multitude of courses. Art museums are close by too. A short distance across the causeway are Tampa and St. Petersburg, with their museums & galleries & every weekend finds a festival, taste, or special music event. Check out directions and distances on 'MapQuest'. Tampa International & St. Pete airports are about 35-40 minutes away. the beach before returning to the condo. Also Ruth Eckerd Hall and five smaller community theaters & Chihuly Art Museum. Set your watch to Island Time.